KIEV, Ukraine -- “Dmitri, is that an abaya?” Wandering through the courtyard of Kiev’s Pechersk Lavra, a huge monastery containing caves, catacombs and saint’s relics, I notice several women wearing headscarves or full-length black abayas. Dmitri, my local guide, has no idea what an abaya is, but explains that some of the women adopt customs from old Slavic mythology or the Eastern Orthodox church practices. Moments like this continue to greet me over a long weekend in Ukraine. It’s a culture full of unexpected curiosities, and my predisposition that the infrastructure would be a sea of grey leftovers from the partial Soviet-era destruction is overwhelmingly proved wrong by the variety of historical and regenerated architecture, each with a unique, century-specific story. Exploring Ukraine feels like walking through the chapters of a history book. My taxi ride from Kiev’s newest airport, Zhulyany International Airport, is the only car journey that’s necessary over my two days in the city. 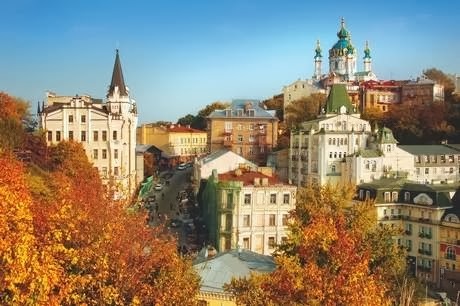 Armed with a map, I head straight out on foot from the Radisson Blu, from Dh700 ($191) per night, including Wi-Fi, in Kiev’s Podil area, a bustling district of trade and commerce that’s manageable on foot and within walking distance of some of Ukraine’s most impressive architectural structures. Within five minutes of Podil’s centre, I reach the foot of St Andrew’s (Andriyivskyy) Descent. A cobbled incline filled with cafes, restaurants and people selling souvenirs and vintage relics from the most tumultuous eras of Ukraine’s history, from the Second World War to the old Russian empire. I stumble across a few post-war, 1948 Olympic-edition, vintage Leica cameras with prices starting in the US$300 (Dh1,102) range, but don’t stick around long enough to be able to prove whether they’re authentic. The peak upon which St Andrew’s Church rests provides a panoramic view of Kiev’s hill-and-valley terrain, and unlike other buildings that I had walked past so far, St Andrew’s presents an image of grandeur and wealth, exaggerated by the structure’s Taj Mahal-esque love story origin. Built by the same individual behind Russia’s renowned Winter Palace, the spires of St Andrew’s glimmer in majestic aqua and gold. It’s easy for frequent city explorers to get “templed or churched-out” when trying to squeeze in visits to as many landmarks as possible within a few days. An afternoon walk around Kiev, however, doesn’t get dull. Its complex history of periods of prosperity, war and Soviet rule has resulted in a richly diverse architectural landscape. My untrained eye immediately picks up on the combination of colourful, Vienna-style buildings, theatrical Baroque style and Stalin-era, grey, functional towers. The diversity never gets tiresome. If anything, it makes me more curious about Ukraine’s complicated history. Aside from religious landmarks, there’s also the impressively grand National Opera House and the Golden Gate, which defined Kiev’s city limits in 1307, but has since been restored. I don’t manage to catch a ride on the cable car that connects the upper and lower part of Kiev, but a local recommends a journey on the funicular that connects the lower city from Podil to the upper city in Mykhailivska Ploscha, Dh0.30 ($0.08) per person. Kiev has had years of constant upheaval from wars since the Mongol invasion in1240 but, despite the 1930s Soviet regime destroying many structures, Ukraine’s attitude illustrates a resilience, and the city is clearly proud of demonstrating how it’s fought back. When Dmitri asks me to hazard a guess at the age of an ancient-looking building, I estimate at least 500 years. It was actually constructed in 2003 using the original plans from the 10th century to bring back some of the old and magnificent Kiev. This is one of many examples of how Kiev has attempted to regenerate without forgetting its roots. The most impressive structure in Kiev is St Sophia Cathedral, taking more than 10 years to build by Old Russian and Byzantine art masters. Partially destructed during the Soviet rule, the regenerated section has been built around the remains without tainting the original Baroque architecture, including 13 gleaming golden domes, which would make even the least enthused tourist stop and stare. A few hundred steps up the flight of stairs of St Sophia’s bell tower next door is worth the burning thighs for the bird’s-eye view over St Sophia’s domes and across the green hill areas of Kiev that cocoon the lower part of the city. Countries in Eastern Europe occasionally have the reputation of having an unfriendly or cold culture. In Ukraine’s case, this generalisation is a rather unfair one. While there are no smiles for the sake of smiling, all the locals I meet and speak to are very warm individuals. The local cuisine is equally warm and inviting. Tsarske Selo $10 [Dh37] to $15 [Dh55] per person) is a good place for a long lunch between sightseeing, serving local cuisine of borscht (vegetable soup), varenyky (dumplings) and the addictive pyrizhky potato pancakes served with sour cream. On every menu I come across in Ukraine, chicken Kiev was a staple option, but I learn from a local that its origins likely lie in Russia or France. English is not widely-spoken in Ukraine. Booking in a local guide for a walking tour for your first day is a good idea for an orientation of the city and an introduction to key local words to help navigate around the street signs and food menus. Moving between Kiev’s districts can be done via the city’s extensive metro system. From the impressively grand designs of the metro, you’d never guess the city has had such a disrupted past. I tested it from the deepest metro station in the world, 105.5 meters (346 feet), at Arsenalna back to my hotel in Podil. A large part of the city’s three-million-strong population must be in the metro, or at least that’s what the rush and chaos feel like. I recommend being quick and nimble on the system: while the trains arrive every few minutes, blink and you might miss the train doors open and close. After two days exploring the best of Kiev but barely touching the surface, I take a one-hour flight to Odessa, the country’s southern city resting on the north-west tip of the Black Sea’s coastline. Constructed by a Dutchman, invaded by the Ottoman and Russian empires and a place of ex-Turkish settlement, the clash of culture and architecture is wonderfully haphazard but manages to remain distinctly Ukrainian. Odessa has a strikingly different culture, feel and climate from Kiev, leaning more towards Mediterranean than Eastern European. Ukrainians visit Odessa as a holiday destination because, as a local explains: “It feels like a different country”. While Kiev’s pace is steady but sure, the energy from walking around Odessa is frantic. A younger city than Kiev, Odessa’s streets are based on a grid system, the overwhelming majority of which have free public Wi-Fi, so navigation on foot is the simplest and best way to explore the city. Within a 25-minute walk of each other are the Opera House (tickets for shows start at $15 [Dh55]), the Potemkin Steps descending into the Black Sea port, the City Garden, cafes and the trinket shopper’s and art gallery-phile’s ideal haven, Primorsky Boulevard. Similar to Kiev, the architecture spans many centuries. Odessa however, has more pastel-coloured, Venetian-style architecture, contributing to its seaside holiday atmosphere. The culture strikes me as more laid-back and even the local fashion is more diverse. Aside from the port area, the rest of Odessa’s coast is beach, accessible all year round but probably most enjoyable between May and September. Unlike its neighbouring cities, English is more widely spoken in Odessa, which makes navigating through a food menu much easier, but chips away at the fun element of surprise when the dishes arrive at the table. My most memorable meal in Ukraine is a 10-minute drive outside the Odessa city centre. A mid-20th-century, Soviet cottage-and-garden restaurant, Dacha serves a full variety of local cuisine, locally grown vegetables, condiments and take-home preserves; the relaxing garden venue, with 1950s-style decor, makes diners feel compelled to take time over a meal, rather than rush through. The Odessa Museum of Arts contains a huge collection of Russian and Ukrainian arts from the 19th and 20th centuries, contained in a palace presented to the city by an art-loving patron. Aside from the two floors of art above ground, there are two floors of softly illuminated underground grottos below the palace that can only be accessed with a guide. Following the short spiral footpath into the palace’s underground, the guide explains how the grottos, which stay a constant temperature all year round, were frequented for secret meetings, fateful passions and winter parties. Central Odessa has a full range of hotels, hostels and bed-and-breakfasts. During the summer months, I recommended booking into a coastal hotel. For autumn and winter, any hotel within the pedestrian-friendly centre of Odessa is within a 15-minute walk of the city’s most impressive landmarks. Perhaps learning about Stalin’s regime at school had left me with assumption that Ukraine would be a place still trying to shake off the grey cloud that war and invasion had left. The country has instead used the unstable years to it’s advantage by constantly regenerating to illustrate the colourful variety of Ukraine’s roots combining Cossack, Slavic, Russian, Polish, Turkish and Mongol influences. Five days is enough time to enjoy the best of Ukraine’s landmarks, leaving me with an appetite to learn more about its history and explore more of Eastern Europe, and the knowledge that a Mediterranean-style beach holiday is only five hours away from Dubai.